canning | Violet Makes Things. Everybody loves this recipe because it really and truly is as easy as it looks. And everyone makes it and says, “I think I did it wrong..” because of the wet dough and the fact that it just seems WAY too easy for anyone who’s ever made bread before (or who has decided not to make bread because it seemed too difficult). Combine flour, salt, and yeast into a large bowl. Add the water and mix (by hand) until everything is combined and rough looking. The dough is very, very soft – you won’t need to put much effort into mixing this up. Put a lid on your bowl, or cover with plastic cling wrap. Set it aside for a minimum of 12 hours (and as many as 24). The dough blob will get much larger, look very bubbly and wet, and you’ll be concerned that you have done something wrong. Don’t panic. While the oven is heating, heavily flour your counter and dump the dough on top. It will be very sticky, wet, and goopy. You will again be concerned that you have done something wrong. Don’t panic. Shape the dough into a ball – not kneading, just sort of prodding it into shape – and cover the ball with plastic wrap. Set aside until the 30 minutes of Dutch oven-heating are finished. When the oven has heated, and the Dutch oven has been inside for 30 minutes, pull out the Dutch oven and plunk the dough into it. You can use a layer of parchment paper if you like (I did) to make it easier to transfer the dough from the counter into the really, really hot Dutch oven. Put the lid on the Dutch oven and put it back into the oven for 30 minutes. After 30 minutes, remove the lid.. and bake an additional 15 minutes. Remove bread from oven, pull it out of the Dutch oven, and place on a cooling rack to cool. Cool fully before slicing. Enjoy the crackling noises! You can make this in a Dutch oven that’s as small at 3 quarts, apparently. I used a 6 quart and the loaf sat in the middle and didn’t get anywhere close to the sides. All good! You can also make it in any oven-safe pot with a lid, according to the internet. I wanted to continue to involve my 13 year old son in the process of canning things, so we decided to make BBQ sauce together. The process didn’t involve much chopping or dicing (though he was unimpressed with the onions stinging his eyes and the amount of time that it takes to press the garlic) and it came together fairly quickly. It was messy, however, and involved a lot of measuring. We used this recipe and doubled it (for a total of 15 pints). We then pressure canned it (so we could stack, as noted in the photo above). One jar leaked (ew) and two didn’t seal properly (so they’re in the fridge) but the taste is pretty darned good! This is another one of those soups you make ahead of time and, when you’re ready to eat them, just add some cream and heat! Unfortunately, Potato Leek soup is not particularly pretty. it’s sort of a greeny-yellow colour, in fact, with specks of pepper floating in the jar. But oh, man, this is some GOOD stuff to eat. Not pretty, but SO tasty! Combine the potatoes, leeks, celery, water and salt in a very large pot. Bring to a boil, then lower the heat and simmer until everything is soft and happy. Return to simmering for another 10 minutes. Fill quart jars, leaving 1 inch head space. Wipe rims, apply lids and rings. Process for 45 minutes at 11 pounds of pressure. Add 4 tablespoons of heavy cream per quart. Heat the soup and serve! 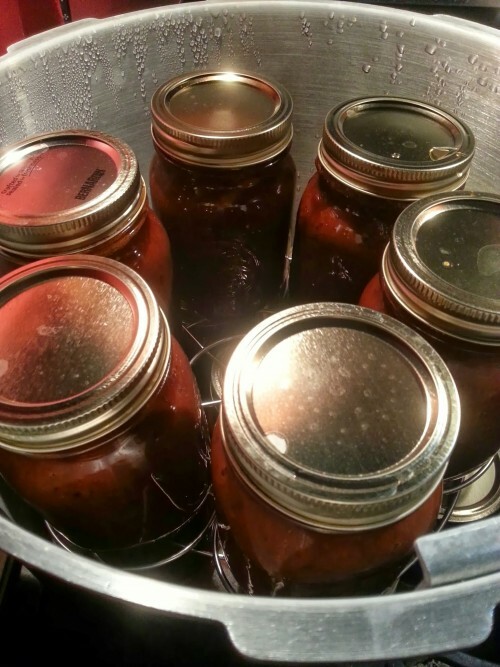 I recruited my 13 year old son to help make some pressure canner sloppy joe sauce – and he pretty much did the whole thing himself with me giving him the tips and tricks as we went along. It’s his first time canning anything – I couldn’t be prouder. Prepare 6 pints, lids, and rings. In a large stainless steel pot, cook beef and onion over medium heat. While cooking the meat, mix all of the other ingredients in a large bowl, whisking to make sure it’s well blended. Drain the meat and onion mixture very well, removing as much fat as possible. Add all of the ingredients together in the large pot and bring to a boil, stirring often. Continue to cook at a lower heat for 20 minutes. Remove from heat. Fill jars to 1 inch head space. Clean rims and apply lids and rings. Process pints at 11 pounds for 75 minutes. Meat – the final frontier. Or something like that, at any rate. I’ve seen a lot of different recipes for pressure canned meat and figured it was worth a try. My canner came with basic information about canning meats, so I figured I’d go with something simple. Place pork shoulder into crockpot and add water. Set crockpot to “HIGH” and leave it for 1 hour. Turn crockpot down to “LOW” for 8-9 hours. Meat should be mostly cooked (“rare”). 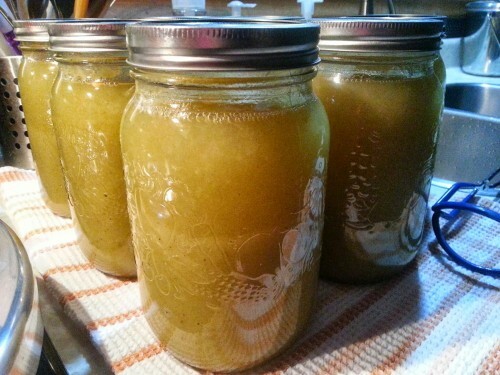 Bring 4 quarts of broth to a boil. Shred the pork, taking care to discard as much fat as possible. 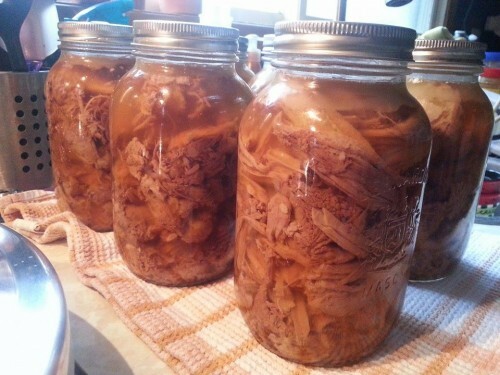 Put shredded meat into hot, quart-sized jars, leaving 1 inch of head space. Add boiling broth to each jar, leaving 1 inch of head space. Wipe jar rims clean and put lids and rings onto jars. Process at 11 pounds for 90 minutes. 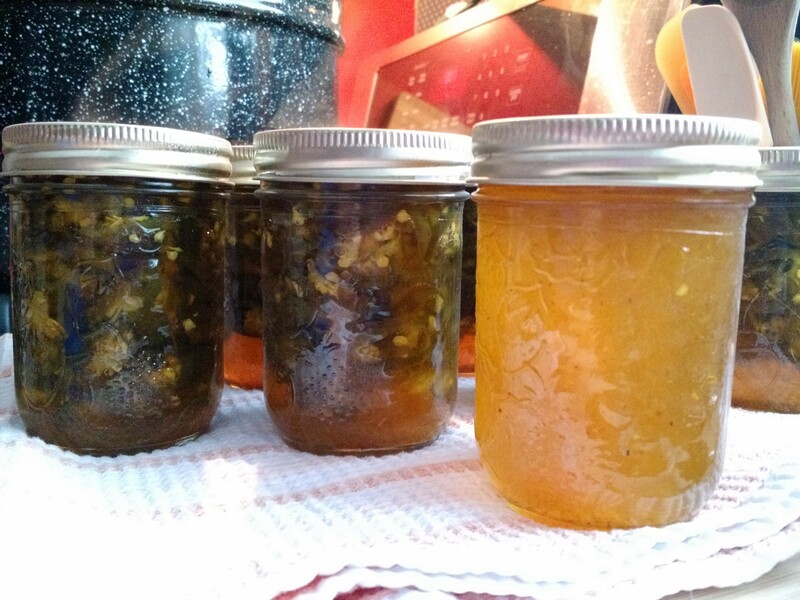 Jars should seal. 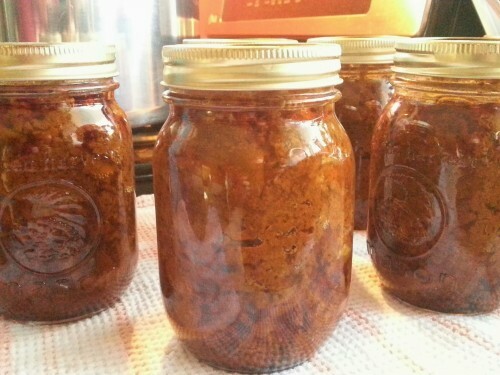 If jars don’t seal, put them in the fridge and eat within a few days. You can eat the meat straight out of the jars (it’s fully cooked! ), drain it and heat the meat up with sauce (for pulled pork sandwiches), or you can use the meat in soup or other recipes.